The Prix Guzman with a first prize of 100,00 francs was offered by the French Academy of Sciences for communications with extraterrestrials. Martians were excluded because they were considered too easy to reach. Orville Wright made the first officially recognized flight in which a machine carrying a man raised itself into the air by its own power, moved forward without reduction of speed and landed at a point as high as from which it started. M. Wolf discovered asteroid #580 Selene. Born, Willard Frank Libby, physicist and chemist, inventor of radiocarbon dating, Nobel 1960 "for his method to use carbon-14 for age determination in archaeology, geology, geophysics, and other branches of science"
G. Van Biesbroeck discovered asteroid #1270 Datura. The first flight was made by a Douglas DC-3, one of the most significant transport aircraft ever built. A US V-2 rocket reached 183 km altitude at White Sands Proving Grounds, New Mexico before the rocket exploded 440 seconds after liftoff. The US FCC approved RCA's black & white compatible color TV specifications, effectively shutting down Edwin Armstrong's fledgling FM radio network. The Elgin, Joliet & Eastern Railway's Kirk Yard at Gary, Indiana became the first fully automated railroad freight yard in operation. The US test fired the Atlas intercontinental ballistic missile successfully for the first time. Only used briefly as an ICBM, Atlas boosters launched the first four American astronauts to orbit the Earth, from 1962 to 1963. NASA's Surveyor 5 transmitted its last data from the Moon's surface. The US Air Force closed Project Blue Book, announcing that its investigation of thousands of UFO sightings had found no evidence of extraterrestrial spacecraft. H. Kosai and G. Sasaki discovered asteroid #3392 Setouchi. NASA's STS 108 (Endeavor) shuttle mission ended after delivering a new crew to the International Space Station. The first supersonic flight was made by Scaled Composites' SpaceShipOne. 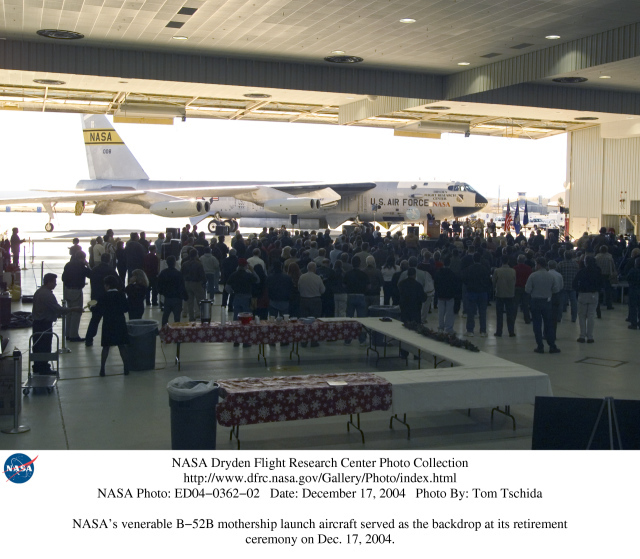 NASA B-52, Tail Number 008, was formally retired after having participated in some of the most significant projects in aerospace history. The US commercial AMC-16 television satellite was launched on a Lockheed Martin-built Atlas 5 rocket. Riding its 196-foot Lockheed Martin-built Atlas 5 booster, AMC-16 was launched at 7:07 a.m. EST (1207 GMT) on 17 December 2004 in a flight staged from Launch Complex 41 at Cape Canaveral Air Force Station in Florida. About 4.5 minutes after liftoff, the Atlas 5 shut down and the Centaur upper stage ignited for an 11 minute burn, the first of two maneuvers that propelled AMC-16 into its geosynchronous orbit. Spacecraft separation occured smoothly about 8:55 a.m. EST (1355 GMT). The flight was originally scheduled for liftoff at 4:41 a.m. (0941 GMT), but was delayed by a glitch where computers controlling the countdown detected problems associated with a booster valve (which proved to be functioning correctly) and by temporary high wind conditions. Since mission controllers were working with a two-hour and 48-minute launch window, however, the launch was able to proceed when the weather subsided. Built by Lockheed Martin for Princeton, New Jersey-based satellite provider SES AMERICOM, AMC-16, like its twin AMC-15 (launched 14 October 2004) was designed to provide direct-to-home entertainment and broadband services across the United States for satellite television customers under EchoStar's DISH Network.